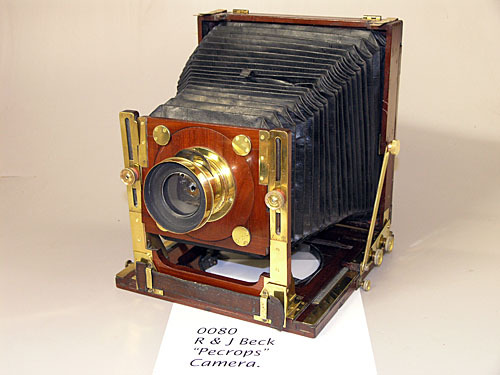 ENGLISH HYBRID STYLE FIELD CAMERA. 1875. R & J Beck were established as a telescope and microscope makers from 1843, well before photography became available to the majority of people. 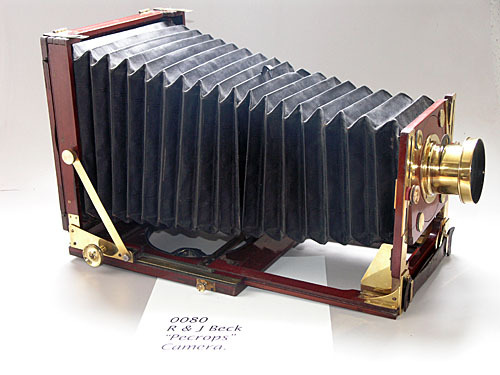 By the 1880s they were exporting lenses in large quantities to America. 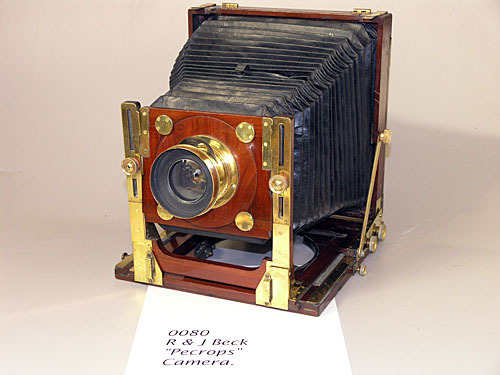 This camera is numbered 586; and earlier one, number 420, held by The Museum of the History of Science in Oxford, was used by the father of Lawrence of Arabia, and probably by Lawrence himself when at school. Using 420 as a known date referent, I have dated mine to 1875. It has several early and sophisticated features which never caught on with later makers, probably because of their extreme high quality and consequent expense. The R & J Beck signature is engraved into the wood, which was Becks' way of labelling, as opposed to the brass or ivory nameplates used by most makers. The unique hybrid design slightly departs from McKellens's patent, as stamped in the front woodwork, by having rear focusing on rack and pinion, while the front standard is fixed but can be extended manually forward for double extension. It came to me with a completely fractured front fork, which was restorable, and with scrap square cornered burgundy bellows which were unrestorable and were replaced by black chamfered corner bellows of a slightly later period. Extra photographs, where available: Click on thumbnail to open in a new page.